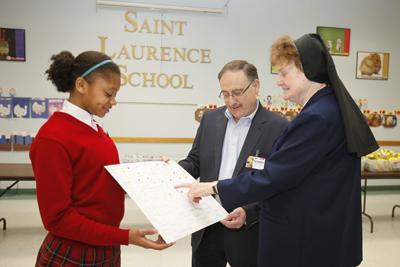 Tiffany Moore, student council treasurer of St. Laurence School, and Immaculate Heart of Mary Sister MaryAnne Bolger, school principal, present a student-made thank-you card to Russ Bompartito, store director for Acme Markets. 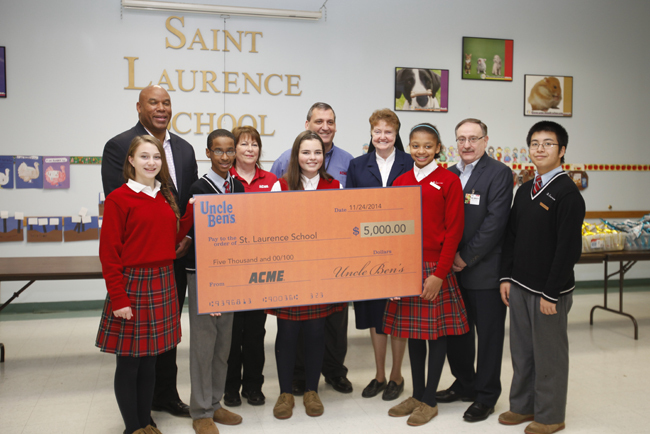 Students at St. Laurence School may soon see some positive changes in their cafeteria thanks to a donation by Acme Markets and Uncle Ben’s brand rice. The Upper Darby Catholic school received a $5,000 donation as part of an Uncle Ben’s cooking contest, which is designed to inspire healthy lifelong eating habits by encouraging parents and children to cook together. Part of the contest includes helping schools reinforce those healthy habits. St. Laurence School will use the donation to replace the oven in the school’s cafeteria. Sister MaryAnne Bolger, the school’s principal, said this donation came at the right time since the oven has been malfunctioning and they were unsure of how to fund a new one.